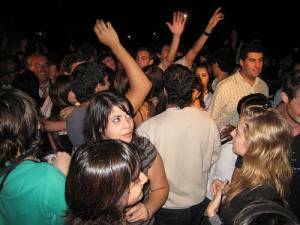 The 2008 edition of the South American Music Conference (SAMC) wrapped up with a day-long dance party. Tens of thousands of people attended the event, which took place at Centro Costa Salguero along the Rio de la Plata. The dance fest featured four separate stages – Tangent, Freak Circus, Electro Place, and Tent – where dozens of international and local DJs spun grooves from three in the afternoon on Saturday until the wee hours of Sunday morning. On a dusky, late summer evening, a crowd of close to a thousand people mobbed the lawn in front of the Palermo Planetarium to practice one of romance’s finest inventions—the slow dance. With a half moon floating appropriately over the Planetarium, the crowd of teens, 20 and 30-somethings and older couples gathered in the early twilight, awaiting the Que Vuelvan los Lentos, or the return of the slow dances, as the event was named. Superstar DJs and a who’s who of the electronic music world descend upon Buenos Aires this week for the South American Music Conference (SAMC). By day, SAMC pulls together artists, producers, record label representatives, and fans for workshops and panels on everything from turntablism to festival organizing to the ins-and-outs of making a re-mix song. By night, DJs in town for the conference entertain the masses at various nightclubs around the city. This page rendered in 0.43 seconds.